Onelogin is a single sign-on and identity management tool for cloud based applications. It will be used to streamline all of PAU's cloud based applications into a single web portal. Once logged on, everyone will have single click access to applications such as MyPAU, Google Apps, Office 365, and Zendesk (PAU Hotline). Another key feature of Onelogin is self-service management. 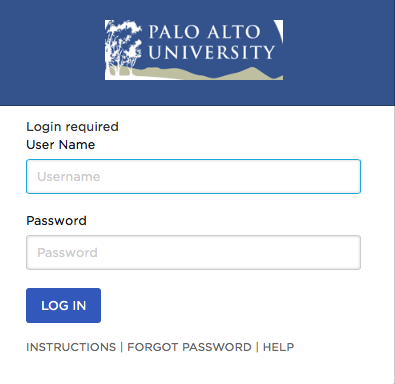 If you forget your password or your account becomes locked, you will be able to reset your account by using a set of challenge questions or having a reset link sent to your email account. We have provided some information below that should be helpful once we go live. You will be required to enter your PAU Username: PAU email name (before the @) along with your password. Notice, if you need additional instructions, forgot your password, or need additional help links have been provided. During your first login you will be prompted to setup your security questions. This will be used to reset your password in case you get locked out of your account or forget your password. Once logged in to your account you will see the applications that have been delegated to your account. These applications can be accessed by clicking on the icon to launch the cloud based service. By default all PAU Faculty, Staff, Students, and alumni will have access to MyPAU, PAU Email, PAU Hotline, and PAU Office 365.